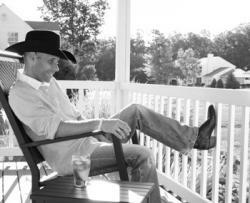 Billy Coffey’s latest novel, The Devil Walks in Mattingly, is the first book I have read by this very talented author. His lyrical writing style, great sense of place and characters that are deeply flawed and yet s0 real, are the reasons I will be reading many more of his books. 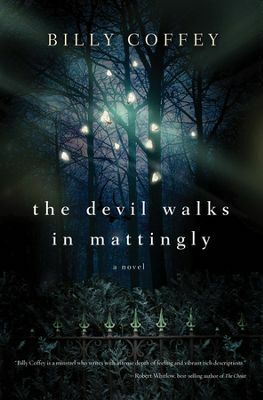 Deeply moving, oftentimes horrifying and always riveting, The Devil Walks in Mattingly is a must read. Jake Barnett, the sheriff of Mattingly, and his wife Kate, live a quiet life trying to undo the past and escape their demons. Their misdeeds and omissions have shaped a life that keeps them stuck repeating old patterns. But when the unthinkable happens, and the town is plunged into their nightmares and deepest secrets, they can no longer deny that the past must be confronted and dealt with. Others are drawn into the horror with varying responses, but none are left unchanged. 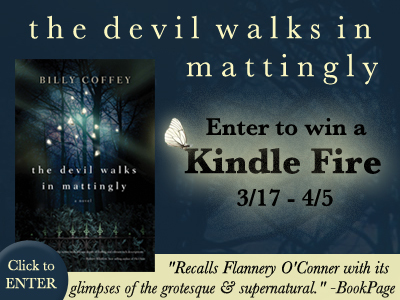 The biggest strength of The Devil Walks in Mattingly is definitely Coffey’s ability to put the reader into the story. The town of Mattingly and the haunted Happy Hollow become very real. The characters, both good and bad, could be your neighbors or friends. It may be a bit disturbing to your sense of self to relate too closely to them ;), but I could definitely relate to the stranglehold the past has on the characters. Great for a book club, there is plenty to discuss — can our present actions make up for our past wrongs, is avoidance a helpful coping skill, where do we find love? To purchase this book, click on the image below. Enter today by clicking one of the icons below. But hurry, the giveaway ends on April 5th. Winner will be announced April 7th on Billy’s blog. Watch Billy give the backstory of the book here. DON’T MISS A MOMENT OF THE FUN; ENTER TODAY AND BE SURE TO STOP BY BILLY’S BLOG ON APRIL 7TH TO SEE IF YOU WON.